This is where I share monthly forecasts based on the Chinese lunisolar calendar. Each month will focus on a theme based on the animal totem and element of the zodiac month. To sign up and be the first to receive updates, as well as info on upcoming shows, readings and projects, please enter your email here. You can read past issues from 2018 here and 2017 here. 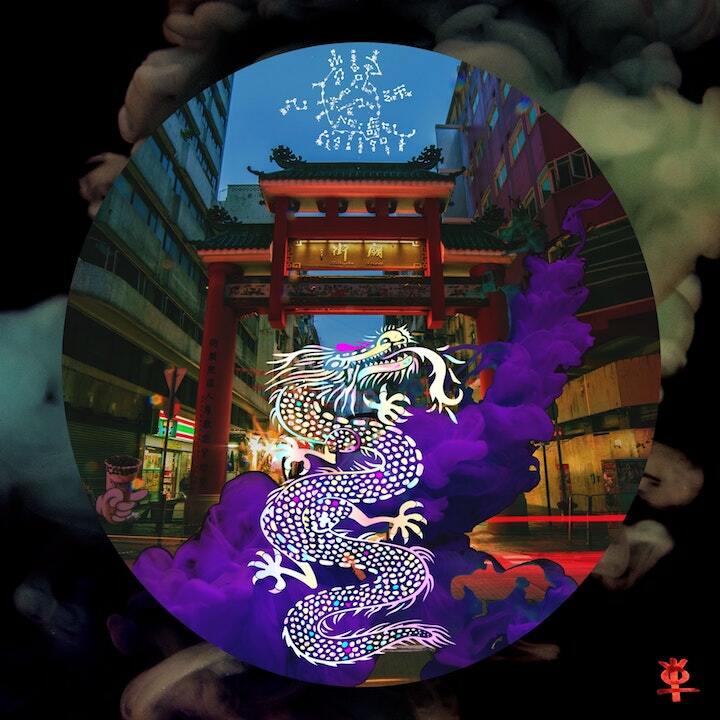 In Chinese mythology, the Dragon is the rainmaker, a magician who possesses the ability to change natural phenomena. At the moment when clouds have reached their maximum density and darkness, Dragon is the one who releases rain, endowed with the power of liberation. The only mystical being in the zodiac, the Dragon flies between heaven and earth, a symbol of unifying the spirit and material realms. Dragon time is the last month of spring and the time of breakfast, when nature is in its most dramatic transformation: the rise of yang energy. Yang Earth is Dragon’s native element and this month is a time of entering the Primal Dragon’s Gate. It marks a transition time, a moment of crisis, and entry into liminal space where structures dissolve and there is a re-ordering of fundamental principles. This month is characterized by coming to a crossroads and stepping across the threshold. It requires letting go of the past and the conjuring the power to lead your life. This leads to an important transition during a powerful situation: the moment right before a breakthrough. Yang Earth Dragon possesses the ability to transgress norms, to go outside the limits due to its mystical power. It represents reaching the breaking point and surpassing all established frontiers. This is a time of excess: pushing your principles beyond their normal limits and accepting the movement this inevitably brings. During this time, you must confront the structures of your life that are in danger of collapse. To reach the breakthrough moment denotes departure and surpassing: if your situation doesn’t nourish you and you are unable to stir up new growth, you must go past it, leave. To work with Dragon energy means being unafraid to order things yourself and impose a different direction. When you do this, the spirits of transgression will be invoked; the guides at the crossroads awakened by your call for a new direction. We are changing whether we like it or not, despite our intention or perception of change. “Change” and “Transformation” connote two different processes, designated in the Chinese concepts 變 bian and 化 hua. Bian denotes external, momentary or apparent change. Hua denotes fundamental and essential change, a true transformation. The difference between a fleeting change and a powerful breakthrough is one’s decisiveness. In the Yijing (The Book of Changes), the hexagram for “Decisiveness” is also defined as “Parting”. What is difficult about decisiveness is that it denotes separation. Being decisive must imply parting with the self that no longer serves our decision to change. We must part with what is unnecessary, un-beneficial and untrue. Because of this, perceptiveness is at utmost importance at this time. Becoming decisive involves a powerful transition: a redefinition of the Self to get to the truth. The Dragon is a hybrid animal (sometimes depicted as part lion, snake, fish or turtle), showing us that we must release the idea of the Self as a fixed identity. To embody the power of the Dragon is to connect with the Self’s true nature: the capacity for change. What is the process that leads us to decisiveness, and how do we know we are making good decisions? The Dragon teaches us that returning to our truth, our center of balance, is not achieved through compromise. This month we are learning how to achieve harmony through the element of surprise. The Dragon is often seen as reckless, however mastering the element of surprise is actually about alchemy - precise measurement and calculation. It is knowing that one does not use disorder to attack chaos, or in other words, responding to fire with fire, or a flood with water. The way to establish balance is the activation of oppositional force to create an intentional disruption, thus creating a transformation. Calmness surprises the fanatic. Humility surprises the greedy. Being liberal surprises the hoarder. It is using order to surprise the confused. Being broad to surprise those that are narrow. It is creating emptiness where others try to hurt us. Through the work of the alchemist, refinement to a pure state can be achieved. There are times for compromise and times that call for unequivocal, firm resolution. It is through our steadfast resolutions that we breakthrough. You must be resolute about what you are separating yourself from - denying power to what you are parting with. Let resolution spring from your heart and the truth be announced openly whenever possible. The process of making a public resolution requires that you examine all parts of yourself. Make a verbal resolution to depart from outdated opinions and part with old patterns. Remember that one who is too full can develop no further and can only invite collapse. Be resolute to change, but know that you are not promised what is on the other side. What promises did you make with your spirituality? Does your spirituality promise you a life-raft? Does it assure that you won’t get wet? Once you reach the bank on the other side, are you promised redemption, salvation, happiness? Keep in mind that this time is only one of many crossings. If you are fixated on an ideal destination, you will never achieve perfection and end up in a perpetual transitory space. In a time of breakthrough where we step into the unknown, we must examine the bargains we have made to manage uncertainty. Do you believe that your spirituality will lead you to visions, wisdom, freedom, healing, and/or clairvoyance? Spirituality is not a transaction. Just like a friendship, if you see relationships only through the lens of what you can get, your friendship will not last. Spirituality is a relationship: it is a place where we go to give, not get. Wherever it is in your life that you are generous - giving without expectation of receiving - that is your spirituality showing up. It is where you go beyond your own needs, not self-cultivation for its own ends. Breakthrough is not a guarantee: it is an offering, a sacrifice of your former self. This month is a time of internal alchemy, an examination of where you are being attached to staying the same. Decisiveness results from accumulated force and the month of the Dragon is not a time for vacillation. We can now act with great strength and power and with practice, the time it takes to make the right decision can be instantaneous. We need to arrange the world around us and inside us to support our transformation. This month asks, are you making decisions that support your life changing or do you make choices that support your life remaining the same? My free gift to you this month: download A Journey with the Yang Earth Dragon, a guided meditation to identify your inner Dragon Spirit. Using breathing, relaxation, imagery and connecting with your body, this Journey exercise is designed to complement this month's forecast. If you feel called to connect deeper with the themes of this month: Decisiveness and Breakthrough, please listen/download the audio below. 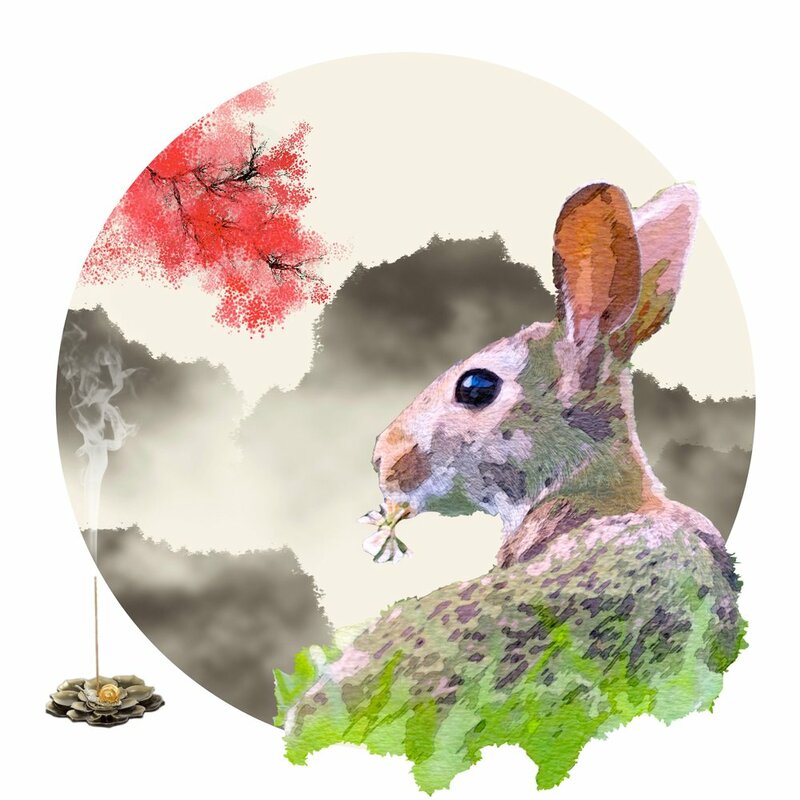 Yin Fire Rabbit is the totem for this year’s second month of spring. As new life is blossoming and bursting forth, this time embodies the flourishing qi of childhood and the freshness of youth. The ancient pictograph for the rabbit sign is 卯, showing doors opening to spring. When innocence is awakened, trust and openness follows. Yin Fire represents inner strength coming from the heart and is symbolized by a candle flame. Inner strength is built through the themes of annihilation and revival. Yin Fire is both a small flame that can easily be extinguished as well as the new spark of regeneration. Even in times of powerlessness, renewal follows the darkness of night. Yin Fire reminds us that the human heart is stronger than adversity. Innocence is the natural genius of who you are, interacting with the spontaneous creativity of the Dao. Innocence is pure, unadulterated power that sleeps within your very being. Through unhealthy family patterning, cultural conditioning and traumatic experiences we adopt a dysfunctional self-image. We become less and less in touch with the innate source of who we are, falling into the shadow side of innocence: victimhood. When our inner victim has authority over us, we cannot take full authorship of our lives. Living in duality, the victim by definition is aligned with being morally righteous, which assumes there is always another party to blame. The wounded heart sees the world through a system of reward and punishment, needing a logical explanation for all painful experiences. Victimhood is being trapped in a childlike relationship to the world, living in fear and loving conditionally. Victimhood can be addicting because it brings help and support from others. We are naturally dependent on others as a species and it is critical to our survival. However, unhealthy dependency is bred through an inability to trust oneself. This is natural for children because they can’t rely on themselves to survive. In order to have a functioning adulthood, we must learn self reliance. This means taking radical responsibility for yourself and what happens in your life. Escaping into victimhood is a form of self-abandonment. It is abdicating your power so that you can be rescued, taken care of and pitied. It is demanding retaliation and seeking affirmation from external sources. What lies beneath is a deep disconnect from one’ s innocent, authentic and innate power. Self-reliance on the other hand is learning to not abandon yourself, with others or through others. Civilization is evolving from a culture of individuality to one of social consciousness, moving from self-empowerment to an empowered heart. In the chakra system, this is going from the 3rd chakra of self esteem to the 4th chakra, relating from the heart. In Yijing divination, we are moving from the lower trigram to upper trigram, from self interest to social awareness. This step is a huge consciousness leap and thus requires a spiritual awakening. The journey out of victim consciousness can only be done through learning the lesson of the child: that the process of continually discovering and loving ourselves lies not outside but within. Innocence in its true form is awakening to your empowered heart. When we stop seeking reprisal from the outside world, we can open ourselves to forgiveness. When we move beyond the victim paradigm, we find there is actually nothing left to forgive. We realize that everybody is a victim: all victims are victims of victims. Therefore, the binary paradigm of innocence and blame does not actually exist. In Daoist medicine, the heart organ is the home of your 神, or spirit. When your heart is not empowered, meaning you have adopted a belief system that redemption is dependent on others, then you have given your spirit away. If you find yourself in a negative victim loop, then you must call your spirit back. You can do this ritualistically, through writing, breathing and visioning exercises, alone or witnessed by others. The key is to reunite with what the Buddhists call the drala principle, or your virginal, genuine and innocent perception of reality. With all the fresh, delicate new life blossoming in spring, we are reminded of the preciousness of existence. Rabbit arouses in us an instinct to protect, nurture and provide welfare. Yin Fire turns this desire inwards, so that we can identify the source of spring within ourselves. This month we are awakening to our innate power and prosperity, capable of surviving times of depletion and regenerating in times of abundance. 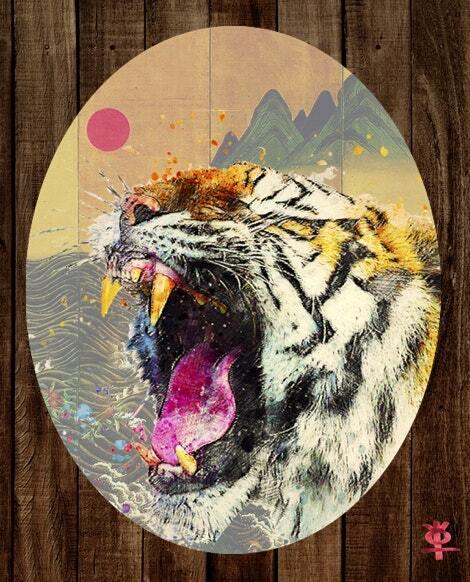 The Tiger in Chinese astrology rules the month when yang energy is becoming activated. It is the month when coldness melts away and animals come out of hibernation. It represents the vigor of birth and the strength needed to push past winter’s inertia. Although the Tiger is known for ferocity and power, the secret to its potency lies in its stripes - the alternation of black and orange, yin and yang. Large cats in the wild can sleep up to 20 hours a day. The secret behind their aggressive power is conservation of energy that borders on laziness. Even during the hunt, a Tiger can stalk its prey for hours, waiting patiently for the most optimal moment to employ explosive force. Because of this, it is a master of effective action. This month is also ruled by Yang Fire, which is symbolized by the sun. All life on earth depends on direction. The rising and setting of the sun is the cadence that governs our activity and rest, giving life on this planet orientation and rhythm. All movement and stillness require a tempo of alternation that is in sync with the environment. There are times to receive and times that call for ferocity. To read and respond to nature with the full spectrum of our available potential is how we develop efficacy. When a Tiger hunts, it demonstrates maximum efficiency. Knowing precisely where you have and don’t have power helps you apply energy only where it is appropriate. All hunters know this formula of harmonizing effort with their surroundings. An archer becomes hypersensitive to the environment, reading the temperature and winds, applying hyper focused energy directed towards their target. When the timing is right, all that is left is to let go. There has never been a time in human history where so much of our lives are handed to us. It used to be that in order to have basic things in your life, we had to make them. From our housing to our clothes, the chair we sit on to the food we eat, we now spend our time acquiring things rather than on the process of making them. This is why so many people feel disconnected from their creativity in modern urban life: we do not participate in creating the things that we have. Relating to our world through consumption is living in extreme passivity. The hidden reality of consumption is pervasive violence - deforestation, abuse of labor and exploitation make mass scale consumption possible. However, this violence is experienced in the daily lives of western civilization as ubiquitous passivity. This numbing state means that innate aggression is repressed and therefore seeks an outlet in our collective psyche. You can look to all of our forms of entertainment, from film to sports to see how much violence exists in our lives as fantasy and fetish. What is aggression and why does it need expression? It is a primal energy that is native to our embodied existence. In fact, you would not exist today without it. Ask a mother that has given birth if the process of labor did not demand aggression. This type of yang energy is also demonstrated in less extreme forms - initiative, assertion, willpower and passion all require aggression. Even creativity cannot happen without an attack on idleness. The truth is, you cannot be effective in life without the proper use of aggression. Efficacy is about directed aggression, not arbitrary aggression. Like syncing our energies with the rhythm of the sun, direction is how we make aggression useful. Daoist masters are sometimes depicted riding a tiger, a symbol of self-mastery. Through self-knowledge and discipline, we learn to direct our wild and ferocious natures; they become of service to us. We find the way to use all our innate drives, not discarding any aspect of our inner nature. Efficacy is activating your whole human potential, meaning you must be awake to your entire nature. You must be sensitive and responsive to the whole world, animating your gentleness as well as your vigor without arbitrary action. Daoist wisdom teaches us that the way of the sage is to be in harmony. Being magnanimous, warm and gentle must be balanced with being strict, stern and straightforward. Wisdom is learning how to harmonize hardness with softness. Too much strictness results in rigidity. Too much love results in indulgence, which is ultimately ineffectual. This month asks, Where are you not being effective? Do you have a practice for exerting healthy aggression in your life? How can you apply the right energy in harmony with the needs of the time? Remember that yin and yang create each other. In order to generate movement, you must begin with its foundation, which is rest. Conversely, the potential for rest is found in movement. The dots in the yin yang symbol show us that the fullest expression of anything lies the seeds of its opposite. If you are in the pursuit of peace, receptivity, and healthy femininity in your life, you must also have outlets for firmness, rigor and exercising your durability. 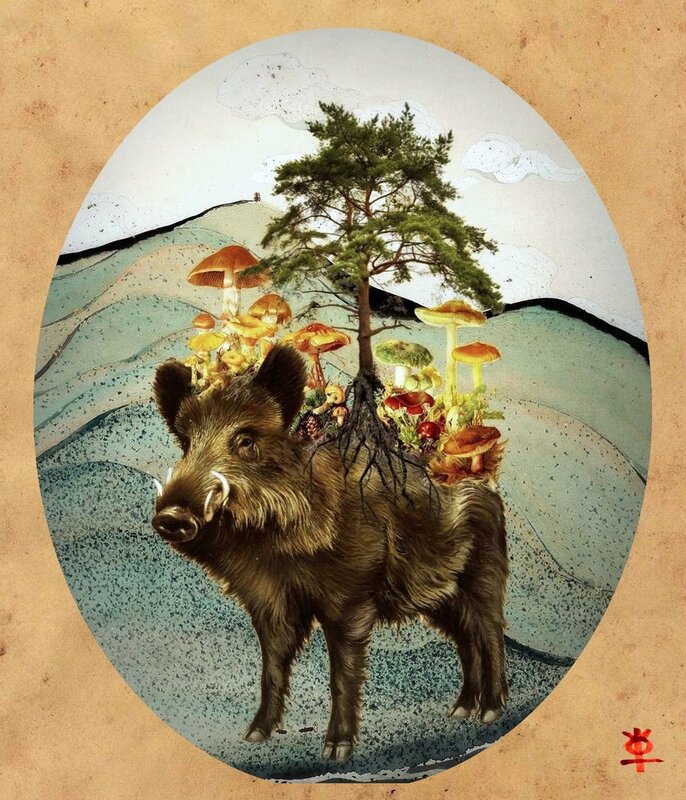 The Pig or Boar is one of the most energetically ambiguous animals in the zodiac. It is the quintessential symbol of domesticity yet maintains an instinct for the wild. Preferring a languid life of comfort and withdrawal, it is nevertheless admired for perceptive and prestigious leadership. It is the embodiment of a yin exterior that holds yang power within, an elegant example of integration. While gentle and adaptable in appearance, the Pig teaches us about our inner strength and courage. This new year is also ruled by Yin Earth, which is symbolized by fertile, soft soil. It demonstrates the qualities of receptivity, invisible labor, acceptance, humility, nurturance and patience. The earth possesses a power unique to itself: the ability to generate new life. The earth accepts all death, rot and decay that lies upon it and brings forth new existence. All beings rely on the earth for sustenance, being the foundation on which all life stands. Both good and evil find home and are supported by the earth. Because it does not judge or reject, it is significant to all. Through indiscriminate submission, it is all-powerful. Conversely, last year ‘s Yang Earth Dog was a time of exercising judgement and separation, acting to reveal the areas of dogmatism and tribalism in society. The year forced us to define our values, pressured us to form packs, call out against injustice, guard against enemies and put up a fight. This year, the Yin Earth Pig brings our quest for truth and integrity home to the most personal level. Our newly defined values will need to resonate throughout all our relationships. Rather than incriminating in a “us vs them” fashion, we must turn our attention to our relationship to home, family and self. This is the principle of integration. Megalomania and authoritarianism is on the rise, from America to the U.K., Brazil, Philippines, Turkey, Russia and Venezuela. The Dog would focus on the egregious behavior of these despotic leaders, assigning blame and asserting a morally superior code. The submissive Pig sees beyond the concept of good vs. evil, asking instead how the rise of fascism elucidates the needs and problems of an age characterized by transition and uncertainty. An authoritarian personality has a pathological need for control that rises to significance in a climate of political and economic instability. Its aggressive over-compensation for inferiority is born out of trauma and a cynical view of humanity. Fear and anxiety abound when a worldview devoid of empathy becomes populated by enemies. This type of personality resonates now because feelings of powerlessness are seduced by external demonstrations of brute force. The Yin Earth Pig is the precise alternative to this show of strength. The Pig exemplifies holding your energy deeply within, even hiding your talents and power when a situation does not support you. In Daoist philosophy, power is harnessed through the path of flexibility - rigidity will lead one to break. When we practice submission, we seek power not through demonstration but from its source. For instance, the use of weaponry is a symptom of weakness. Weapons are always the tool of the weak - that is why they are needed. Although there is a momentary exhibition of strength, it is dependent on an external means. Even a hunter depends on a weapon to kill an animal, revealing the hunter’s innate deficiency in comparison to the prey. If you are mugged at gunpoint, your attacker is in a status of scarcity. The year of the Pig is a ripe time to perceive and re-define true power so that we don’t fall into false projections of strength. It is vital that we refrain from cynicism if we are are to develop a healthy worldview and heal our relationship to power. At the core of integration - the act of making whole - is the practice of interconnectedness, which requires a worldview that is not deprived of empathy. Dogma and rigidity exist in both the political Left and Right. As an antidote, we must create a compassionate reality with acts of willingness and vulnerability. When we practice our values on the most personal level, we see the highest form of courage is the availability of our hearts. Integration means letting go of our labels, status and identifiers that separate us from the truth of our interconnectedness. It is an opportunity to detach from our manufactured identity so that we can restore our friendship with all sentient beings, including the self. We acknowledge that when we do harm, we do harm to ourselves because we are not separate in ultimate reality. Like being caught in a lightning storm, we are in an age where many things are seeking grounding right now. We can model ourselves after Yin Earth and become the ground in which frenetic energy can land and generate new life. It is only through the connection with the earth that new seeds can grow. We take from this example in nature that yang is born from the power of yin. The earth welcomes all things to rest and grow, bearing and nurturing them with its power. If we make ourselves broad like the earth, we become the basis on which all things stand. The industrious Pig, with its snout pointed to the ground, also embodies this concept of humility. By making oneself lower, all things eventually come to you.